Nature apparently disagrees with the calendar this year, because the end of May has not been springlike – it’s been hot, hot, hot and summer sun-soaked around here (not that we’re complaining – we’ve had enough rain). Just in time to switch over to “summerier” flavors in the kitchen. For baking, that means more fruit and less chocolate…well, not that much less chocolate – I’m not crazy. I love the crumble blueprint in Nigella Lawson’s How to Eat. 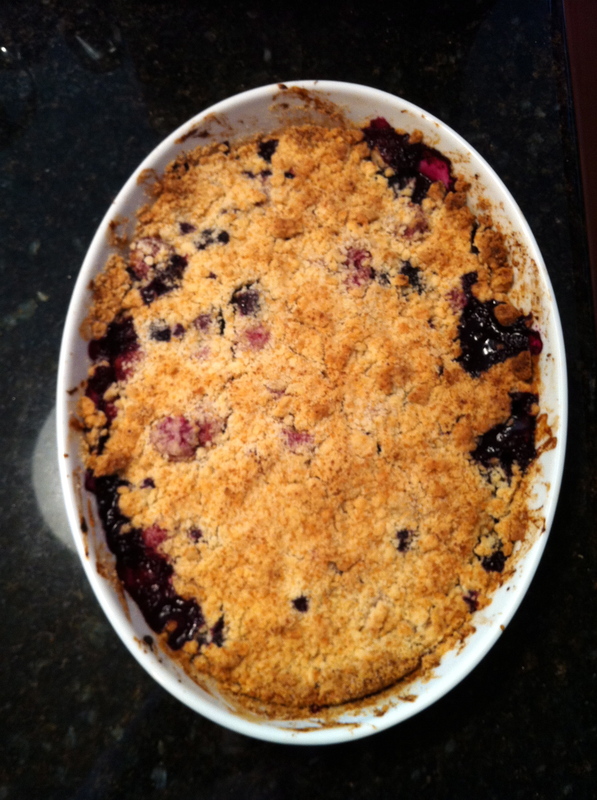 Below are my ramblings associated with a recent Blueberry-Raspberry Crumble. I never plan the fruit in advance, I just take whatever looks good at the grocery store. I’ve used this blueprint separate times with rhubarb and with blackberries, and it’s always worked out, so I’d recommend it! Start with the crumble topping. In a bowl, mix 1 cup of flour, 1 tsp. of baking powder, and a couple pinches of salt. Then cut in with a pastry cutter 6 to 7 tbsps. of cold butter. Once the mixture is uniformly “pebbly,” add in 3 tbsps. each of white and light brown sugar. 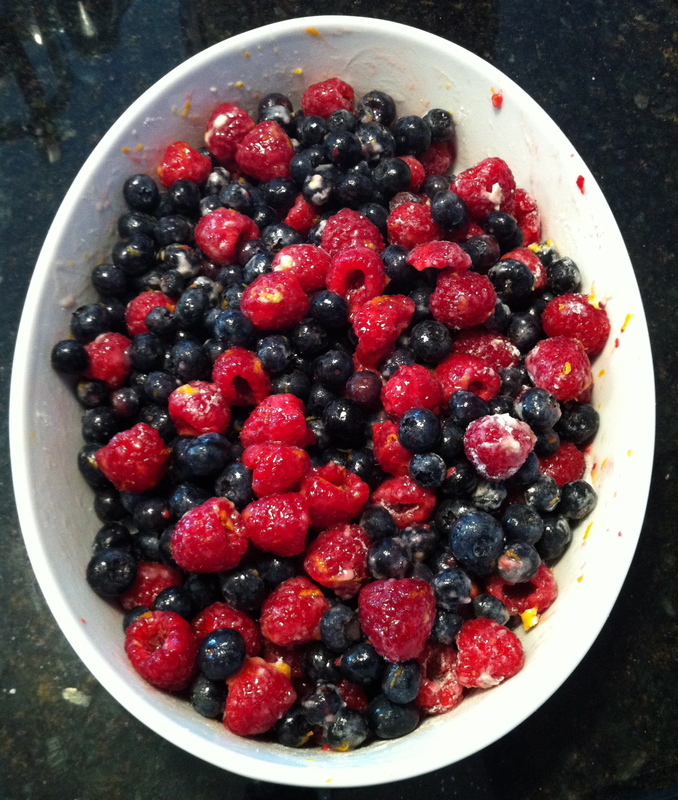 Mix it together, then throw the whole bowl in the freezer to keep the butter cold while you prep the fruit. (NB: quick-cook oats thrown in here would be great, as would slivered almonds, to give nuttiness and texture). Next, preheat the oven to 375 degrees F and prepare the fruit right in the baking dish you’re going to use. Less dishwashing = happier baker. Pictured here are 2 pints of blueberries and two 6-oz. containers of raspberries, each rinsed carefully right before using them. I think the dish is either a 1.5 quart or 2 quart baking dish. I like lots of fruit piled high, otherwise what’s the point? To this, I add about 2.5 tbsps. each of flour and sugar, and the zest and juice of 1/2 an orange. (Lemon could work here in place of the orange, I think, especially if it’s only raspberries, or black raspberries, as they can be quite tart.) Mix this together gently, but thoroughly. Once the fruit is ready, sprinkle the crumb topping straight from the freezer in a generally even layer on top of the fruit. 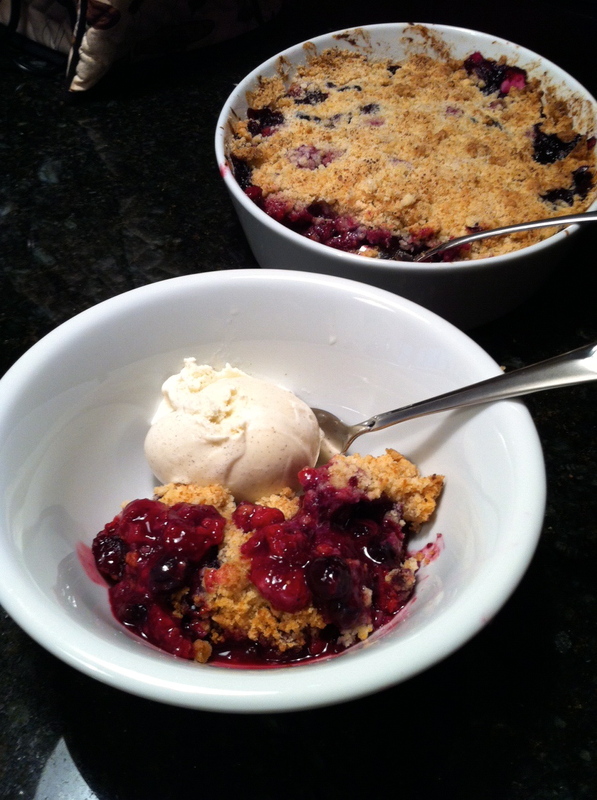 It doesn’t need to be perfect – fruit crumble is not about perfection. I like to put this baking dish on a baking sheet, to protect against any untoward juicy drips landing on the bottom of the oven during baking. Bake the crumble until it’s golden brown on top and has juice bubbling out amongst the crumble cracks (this can take to 35-45 minutes – the one pictured took nearly 45 minutes because of all that fruit and because I find that the baking sheet underneath slows the baking). This is perfect eating whether it’s cold, room temperature, or warm, in all instances with vanilla ice cream alongside. Right, so that covers the dessert portion (and the smartest among us always eat dessert first), but what about dinner? It’s the right season for another long time fave from Nigella, this time her Crab Linguini from Forever Summer. (Yes, there’s a theme, and it’s Nigella. I have all her books. I’ve seen all her TV episodes. I’d build her a tiny little altar in my kitchen if that wouldn’t be completely creepy.) Again, I use the recipe as a blueprint depending on my available tools, ingredients, and level of energy. I also probably use too much crabmeat per person, but you only live once. I like this dish with Barilla’s (go Barilla!) 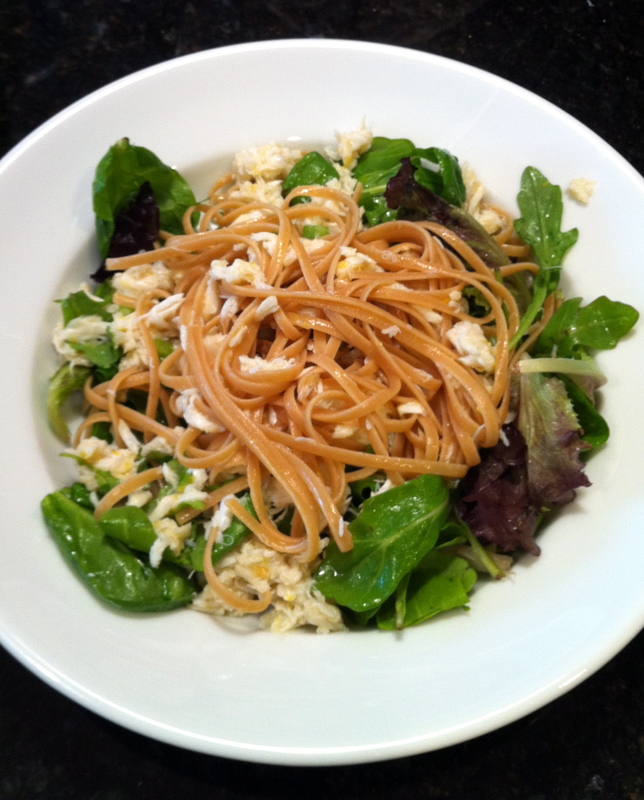 whole wheat linguini, so cook enough linguini for 2 people, according to the package instructions, while you make the “sauce.” In a bowl, I use a grater to grate 1 – 2 garlic cloves, depending on their size. To the grated garlic, I add a tbsp. of coarse salt. Why do I grate the garlic? Because the original recipe calls for the garlic and the salt to be ground into a paste using a mortar and pestle, and that’s not always an available tool. Grating the garlic can give you that pasty consistency and then you can further mash the garlic into the salt with the back of a spoon. Add to the garlic-salt mixture one finely chopped green jalapeno or red chili, deseeded in either case. Use the spoon to mash this combo further. 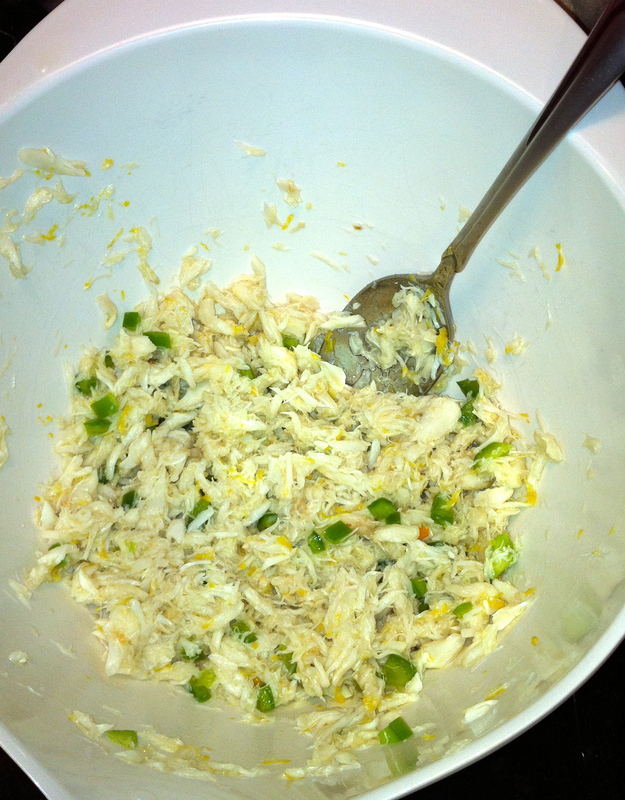 Then add in enough crabmeat for two people, whether that’s lump, claw, a mixture, etc. and gently fold it through the garlic-salt-pepper mixture. Stir in enough extra virgin olive oil to taste – I use very little oil in my food, so this is a scant amount here, and I want to really still taste the crab. Finally, add in the zest and juice of one lemon and give it one more good stir. Taste test it here to see if it needs anything (e.g., more oil, a dash more salt) and pour it over the cooked linguini. At this stage, I also throw in some arugula, for some vegetable representation, but that could be optional if you do an entire side salad for the meal. Well, folks, that’s a lot of words and very few pictures about how good summer can taste in your kitchen. Enjoy! PS: It’s the a la mode “money” shot.